In the business world, this is known as being flexible and adaptable. In our world, it’s known as compensating for inadequate planning. We took delivery of our 2014 Airstream 22FB Sport on Saturday afternoon. We had concerns that it might not make it up the driveway and, even if it did, it might not have the requisite maneuverability on our parking pad. We began strategizing Plans B and C halfway to Dublin. The thing was a beast! Especially when compared to our 14-foot “starter” unit. The Airstream was a foot wider and eight feet longer, and there was NO WAY it would ever fit in our driveway or on our parking pad. But in order to get it back to Dallas in time to initiate Plan B, we had to leave the dealership no later than 3:30 p.m. That didn’t happen. A very helpful nuclear-physicist-turned-geologist-turned-Airstream-technician named Ray conducted our orientation. One problem with engineers is that they tend to be extremely thorough, and they often specialize in presenting worst-case scenarios. Consequently, not only did Ray’s orientation take about three hours, but he also left us feeling convinced that we were either going to blow ourselves to smithereens or we were going to have a blowout of epic proportions that would leave our rig a splintered mess. We left the dealership close to 4 p.m. On to Plan C.
We towed the Airstream to our favorite backyard state park for an overnight stay. Arriving at Cedar Hill State Park around 6 p.m., we got a great site and maneuvered the rig onto the pad without a glitch–much to our own amazement! One word about the Airstream: Everything the company says about fuel efficiency is true. 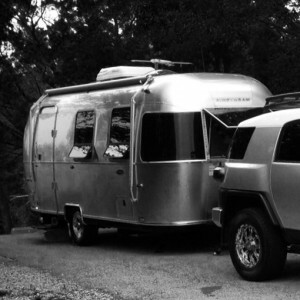 We used about 20 percent less fuel towing the Airstream than we did our other, smaller rig. Score one for aerodynamics! Because we hadn’t planned on camping, we reluctantly left the Airstream behind and drove home to collect the dogs, a change of clothes, some chow and a few other essentials for our overnight stay. Our first night in the Airstream was an unexpected pleasure. Everything we had hoped for and more. We awoke to gentle breezes and rainfall, surrounded by snuggling dogs and chirping birds. Now, it’s back to Plan B: Storing the behemoth “off site.” We hate the thought of it, but we have no other choice. This is what’s known in the business world as being flexible and adaptable.